Our Hatha Vinyasa Yoga practice, in conjunction with the principles of Biomatic Anatomy, will bring harmony to your body, mind and emotional state. Emphasizing on linking movement with breath as well as awakening your body/spirit awareness, our Yoga practice will elevate your energy flow and open generously space for bliss. You will learn how to develop a daily yoga practice incorporating breathing sequences in an accessible manner for emotional stability and meditative insights, details of physical and esoteric physiology while moving and therapeutic relaxation techniques. You will cultivate a set of conditions that allow the body’s natural intelligence to flourish and make Yoga an essential tool for a balanced everyday life. Apostolia is transmitting her knowledge gracefully through her heart, voice, and hands. Her Yoga class, a unifying blend of Pranayama, Asanas, Mantras, and Meditation is a powerful tool for self-transformation. Free within herself and her soul, Apostolia is teaching Asanas with an extraordinary fluidity and relaxed strength, reaching a meditative state of motion while practicing. 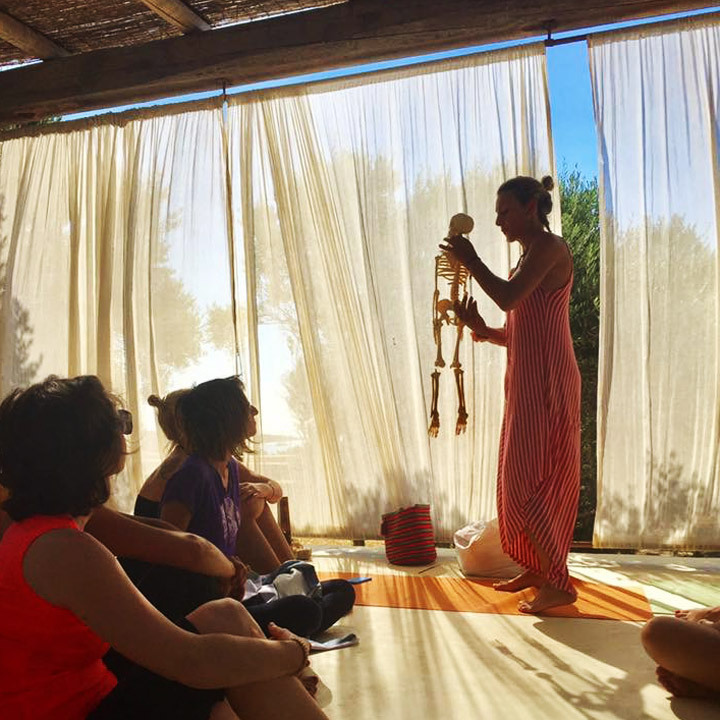 She teaches to all the participants "effortless movement" with an anatomical precision always connected to the breath and she believes that everybody can find happiness never felt before through practice. 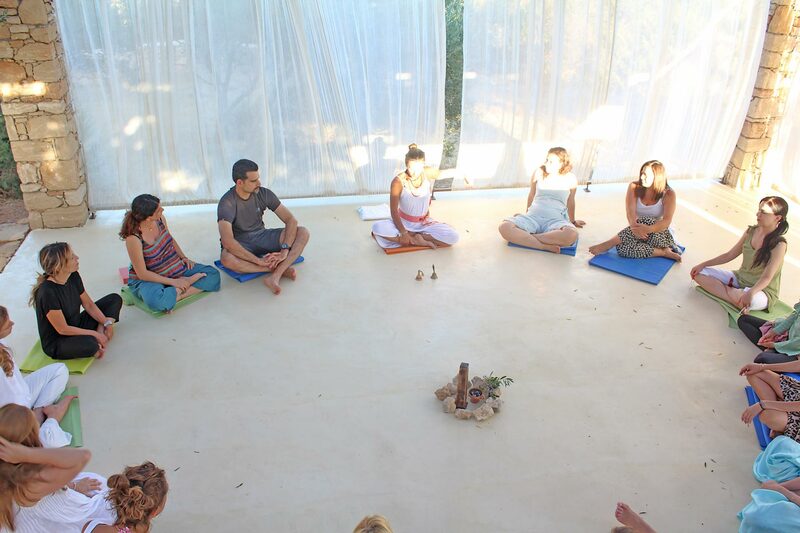 Providing insightful guidance and tender support, Apostolia empowers each participant to discover his inner beauty with simplicity and playfulness. Biomatic Anatomy is a holistic method of embodied anatomy, mindful breath & spiritual awareness, the result of continuous study and research of its founder Apostolia Papadamaki. Aims to remind us of the primary instincts of movement and gain experiential and theoretical knowledge about our skeleton & joints and how they work. The belief that the body knows it’s prime perfect nature is established. Movement patterns connect with emotional patterns. In Biomatic Anatomy, we aim to realize our stress movement patterns and to replace them with new ones that will allow the joints to work fully with the necessary muscle involvement. Always connected with our breath, we reclaim our relationship with our body, we heal hidden traumas, we eliminate our fears and we create confidence and euphoria. An aquatic bodywork that will enable you to embody the art of true belonging and trust oneness in the fluidity of the sea. We all come from the womb of our mother and we have experienced “floating”. Water is conductive so it can help us remember our true nature, it can facilitate a rebirth experience. While floating in the water, the absence of gravity releases our vertebrae and allows our spine to move in ways that are not possible on the land. Smooth, progressive movements and manipulations increase our awareness of how much freedom we gain while floating. Our connection with breath takes on a new dimension. We surrender to our companion ’s hands, we synchronize our breathing, we «dance» in slow motion. A variety of emotions might be released through the continuous flow process. This 'giving' and 'taking' energy experience, can heal any wounds we might carry from separation and enhance the feeling of union and unity with others. Water Spirit Contact Dance is practiced on the surface of a swimming pool or the sea. It is suitable for participants 12-80 years old and is ideal for individuals, couples, family members, and pregnant women at any stage of their pregnancy. Apostolia is a certified PADI Rescue Diver. She has choreographed Drops of Breath, the 1st underwater dance performance in the world. Everything in nature is Pulse! We begin by grounding ourselves, in the safe space of a circle, shaking and pulsing to release tension, increase blood circulation and connect with the cosmic energy of the Earth. As we pulse in different levels, our breath expands into sound and our voice can be liberated. We enter a state of profound ancestral connection and our shaking movements awaken the sacredness of our body and manifest the power of its expression. In union with our pulsing body and voice, we create an entrance to our soul, establishing a deep level of freedom - we reach our euphoric state of being. Our inner “impulses “ for movement transform into dance and we start interacting with each other playing with space and time experiencing a dancing and pulsing community of creative harmony. We are deeply connected with all there is and we become the “Dance”. 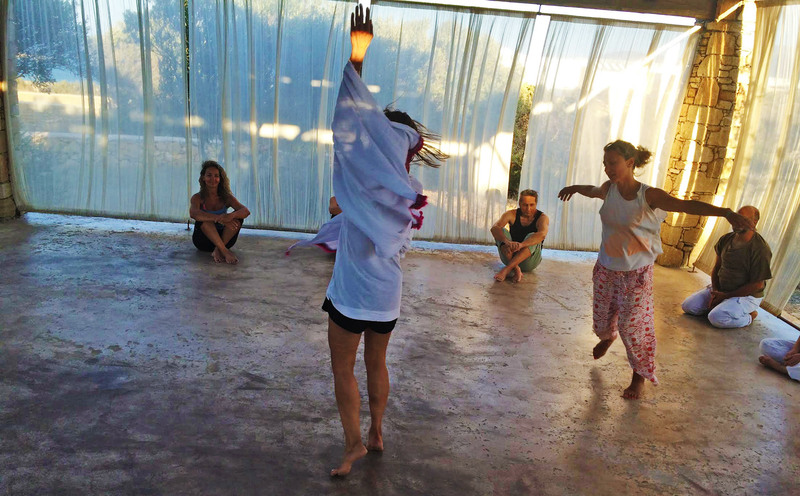 Structured through Apostolia’s deep experience in contact improvisation, contemporary dance, Osho Kundalini meditation, traditional and sacred dance forms, this spiritual dance language speaks where words fail; an abundance of bliss in the heart of existence is created.